A pewter amulet pair showing a black cat and a small interwoven pentagram. Comes with both charms. Made in USA. Has cord. Pewter. 1" x 1"
These are just adorable! 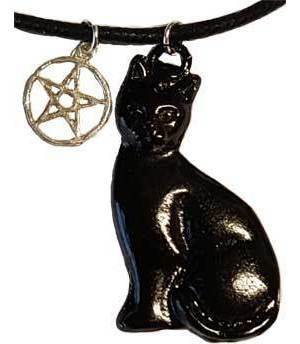 I work with Bast and I have not been able to find a good necklace that I felt was suitable to represent her. I came across these and just fell in love. I bought matching ones for me and my daughter.